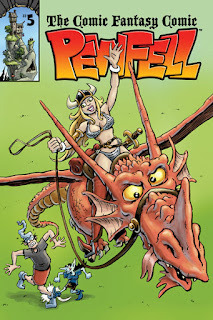 The Fellowship was fortunate enough to obtain a copy of PEWFELL #5 from comiXology Submit. Chuck Whelon writes and draws. Pewfell is probably the world’s worst wizard, and he does very little to disprove this claim. He’s got a seriously hot, successful adventuring warrior wife and a house gnome who mocks him mercilessly. He’s got incompetent friends and, not surprisingly, a major case of depression. And when destiny seeks him out, he just can’t seem to make the right decisions. It’s not often that someone decides to try comedic fantasy. It happens from time to time, like Groo the Wanderer, for example. But for the most part, fantasy is very serious. Pewfell is one of those attempts, and I think it works pretty well. Our “hero” is a pretty regular guy in a world where wizards are pompous and bombastic, which goes a fair way toward making fun of the genre right there. And let’s be real here; there’s plenty to mock in the genre. I love fantasy, and I love comedy. And this is good on both counts. Definitely check it out. PEWFELL #5 is available now online at comixology.com.